Too many kitchens are cluttered with stuff that isn’t needed, or tools & equipment that are either broken or down-right cheaply made. Be honest, how many of you have a “mystery” drawer that you’re afraid to open? With so many gizmos & gadgets on today‘s market, setting up the kitchen with necessary tools can be daunting. What exactly does one need to prepare food efficiently? There are two major factors to consider when setting up your kitchen: quality items and organization. Buy good quality items the first time around (or, better yet, select them for your bridal registry to receive as gifts!). It’ll be cheaper in the long-run because you won’t end up throwing away inferior tools. Also, know how much space you can spare to store an item before buying. Remember, if you can’t store it, don’t buy it! If you break the kitchen into sections, organizing is pretty easy no matter what size space you have. Baking station: 1 set each, measuring spoons, dry measuring cups, liquid measuring cups, mixing bowls; rolling pin; bench scraper; (at least) 2 baking (cookie) sheets; 2 cooling racks, 2 - 8” cake pans, pie pan, 8”x8” square pan, 9”x13” pan, muffin pan, electric mixer - hand or stand model. Cooking station : a good quality set of cookware - 7” or 8", 10", 12” skillets- with lids, 1 qt, 2 qt and 3 qt. saucepans, 4 qt, 6 qt, 8 qt pots (with lids), large roasting pan with a rack. Dowel (for making boorma pastries) This can be purchased at a home improvement center. Vegetable scoop/corer (for making dolma) Note: This tool is about 10 inches long, a 4 inch wooden handle with a 6 inch, thin, curved, serrated cutting edge attached to it. It’s used to scoop out long, thin vegetables, such as zucchini, and can be purchased in well-stocked Middle Eastern stores. Click on Armenian Kitchen Essentials for a breakdown of tools and their uses. 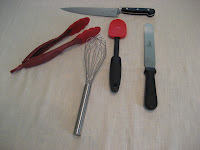 Click on Tools for the Armenian Kitchen to see and learn more about what every good cook needs!